What ancient sites were centers of culture and power? 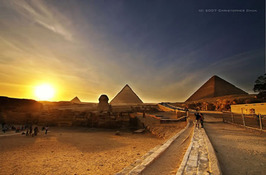 Ancient Egypt is the place to go, but what cities or points of interest are best. You and your travel agency will be experts on one of the cities or places in Ancient Egypt and prepare a travel poster about that site. One of your travel agents from your agency will showcase your creative presentation at the History Expo Night on January 27, 2011. Your agency needs to convince the audience that your Egyptian site is the best place to go on a holiday. Design a 3-panel poster that contains information about your site. Choose a role in your group to support the development of your poster. Follow the specific guidelines on the poster requirement checklist. HSS.6.2.1. Locate and describe the major river systems and discuss the physical settings that supported permanent settlement and early civilizations. HSS.6.2.2. Trace the development of agricultural techniques that permitted the production of economic surplus and the emergence of cities as centers of culture and power. HSS.6.2.6. Describe the role of Egyptian trade in the eastern Mediterranean and Nile valley. ELA-W.6.9. Draw evidence from literary or informational texts to support analysis, reflection, and research.